Phi Kappa Phi student vice presidents, Matthew Melton (left) and Madison von Deylen. 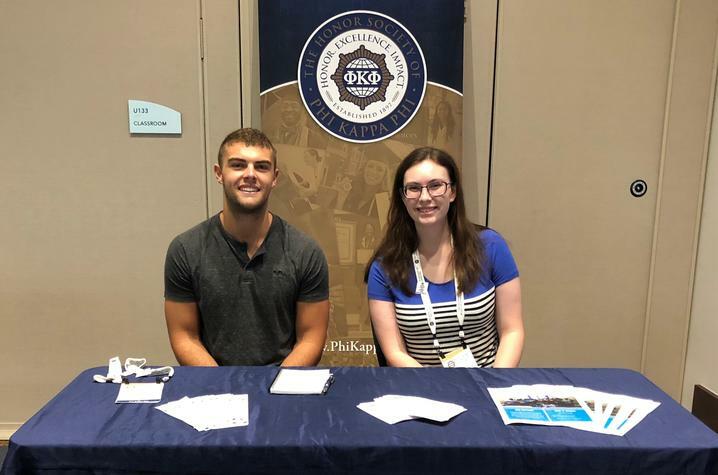 LEXINGTON, Ky. (Sept. 4, 2018) — The University of Kentucky chapter of the honor society of Phi Kappa Phi is kicking off the new academic year by welcoming prospective new student members to a reception at the Boone Center on Thursday, Sept. 6. The event begins at 4 p.m.
Current student, faculty and staff honorees also are invited to attend. In addition, Phi Kappa Phi members who were inducted into the organization at their previous institutions are encouraged to transfer their membership to the UK chapter, which was founded in 2009. Information on how to do this will be available at the reception and can also be found on the Phi Kappa Phi national website under Membership > Renew Your Membership. “The University of Kentucky Chapter of the honor society of Phi Kappa Phi continues to distinguish itself through the active participation of its student vice presidents and through its track record of PKP graduate scholarship recognition,” said Pat Whitlow, director of UK’s Office of Nationally Competitive Awards and president of PKP on campus. Whitlow represented the university's chapter as a voting delegate at PKP’s 45th biennial convention held in early August in Minneapolis, Minnesota. For more information on the UK chapter of Phi Kappa Phi, go to www.uky.edu/Chellgren/Phi-Kappa-Phi or visit www.PhiKappaPhi.org. Phi Kappa Phi is supported by the Chellgren Center.